In my practice of reading cards I often come across people who, although aware of the fact that it’s best to ask one concrete question, formulate questions that can cover several and different areas of interest. Here is an example of a recent reading where I addressed one question by using 5 different throws. The context for the question was finding out about the benefits of moving to a new city. The woman in question also had two other concerns besides leaving her city of residence, Amsterdam. One was related to leaving behind an old love involving a married man, and that didn’t seem to go anywhere, and the other was related to continuing her studies. Three cities were put on the table concerning the following question: should I leave Amsterdam or not? If yes, where should I go, New York or San Francisco? I thought it best to read cards individually for 3 scenarios, by starting with a series of a 3-card spread with the Marseille cards, one for each location: Amsterdam, New York, and San Francisco. For the better option I decided to do an additional 9-card reading with the Lenormand cards that would tell me more about what the woman will gain by choosing that option. What will happen if I stay or if I leave? If I choose the better option how will things pan out for me? As you can see here, the answer is pretty clear. If you stay in Amsterdam you’ll find yourself caught in the love triangle. The man you hope for will be forever caught between two women. The result of this will be with you going round in the same cycle, being in a rut. Your fortune will literally be up and down without anything conclusive or decisive. You’re inclined to stay, the Star in you wants to give and make sacrifices, but only the past is there to receive what you have to give. In other words, if you continue hoping, you will not achieve anything other than going round in the same circle. Your pattern – one that you’re not happy with now – will repeat itself. The man will not make a move, as he is hesitant, so he will also just be delivering the same old story that gets you nothing. 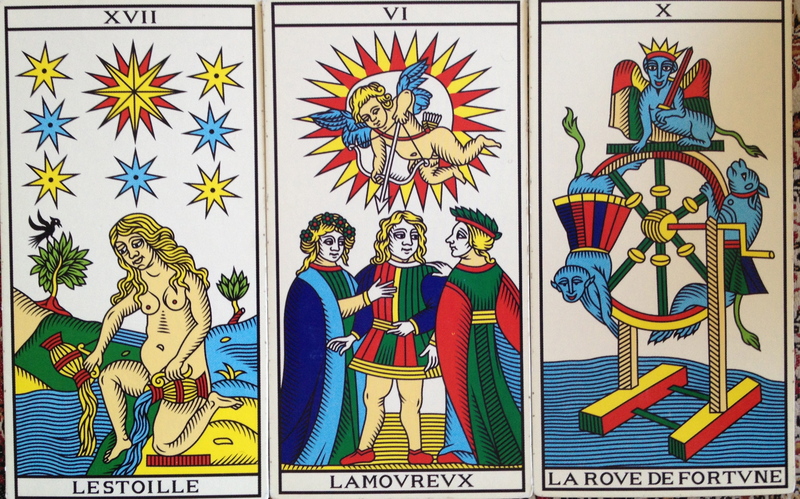 Here the cards indicate that you really struggle with the idea of moving. You’re both confused about it and fearful. The cards here indicate a real shaking of your ground. If you move, you’ll feel depressed and shattered. You will need to call on your inner force to deal with destabilization. The Tower can be overwhelming, but at the same time, you can also see it as a modality through which you will release the tension and the pressure that you feel building up now. Get rid of your frustrations. This is very crisp. You go to New York, and you start over. 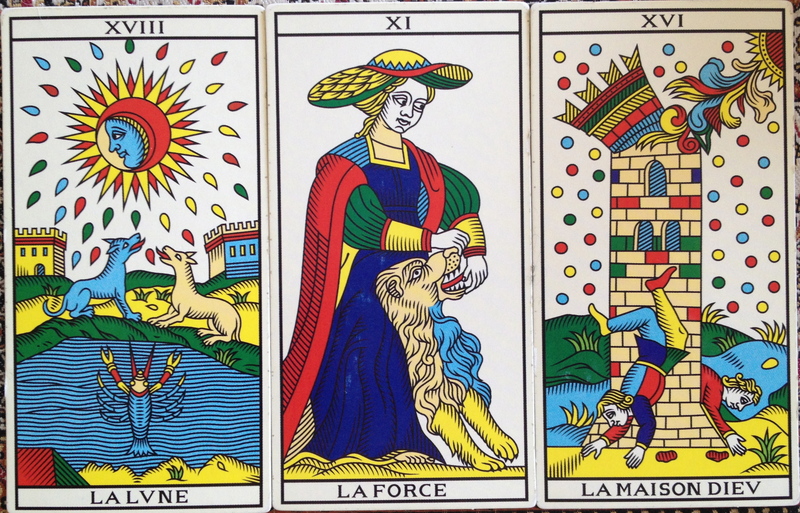 Actually this makes a lot of sense after the Tower; to get the Magician, card number 1. So, a new beginning for you under very good augurs. You are clever enough to make it work. The Magician is not a Magician for nothing. You will also find support from others, and there is a great opportunity to find new love too; one where the feelings will be reciprocated. You will be on the same page with the new people in your life. It simply can’t get any better. You will also find an opportunity to continue with your study. This will go very smoothly under the guidance of a good teacher. Don’t hesitate. Take New York, and enjoy. Others will rule over you. In fact, for all you have to offer, it’s not sure that the materialist leaders will know how to appreciate it. They don’t even see you. The Devil is not good news either. You will not like the environment, and the fact that everyone will be self-centered and self-interested. The Star squeezed between the brutal bosses and evil spirits will not be a happy Star. So, also here the cards speak a clear language. Since New York was the better option, I then proceeded with a more in-depth reading for the likelihood of what life in New York will have to offer. How will it pan out in New York? 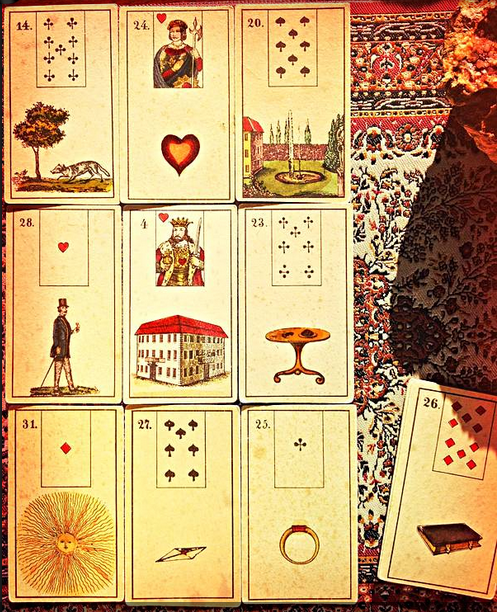 The Lenormand cards here validate very nicely what the Marseille cards have indicated for New York. You start out independently; the Fox is in fact very much like the Magician: good at finding strategies, calculating, and surviving. Paired with the Ring it means that you may find some small work under contract. A bit stressing for you (Ring modified by Mice above), but nothing to worry about as such. A great circle of friends and network will help you with everything (Garden to Sun modified by Man). 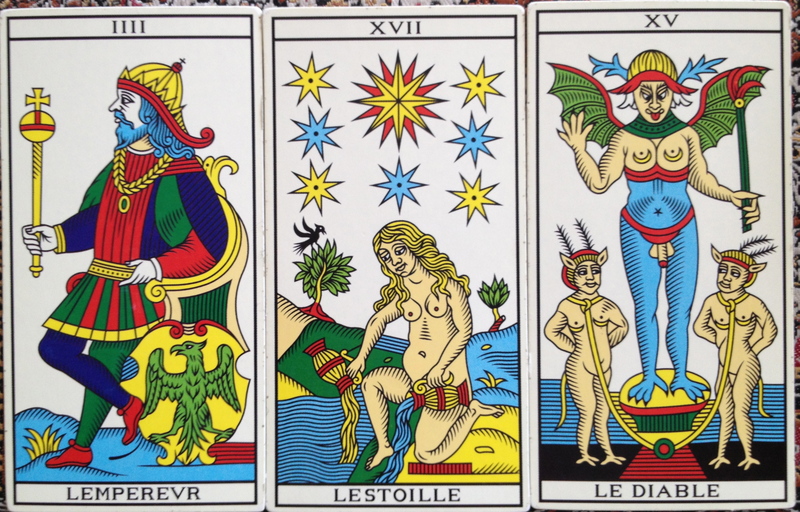 I’m also pleased to see how literally the Lenormand cards spell out the same equally literal message that the Marseille cards have offered regarding the possibility to find a new love interest. Apparently this man here will make a move to set up house with you, so perhaps, all will end with a ring on your finger, rather than just a contract for work. You will receive positive messages about a new home that you would also like to have. More concretely, it looks like your heart will want to be receptive to the advances coming from this new man, even though he may be too eager (the Mice), and you will feel divided, perhaps because there may be interferences from third parties in your heart affairs (The Mice modified by Garden). Don’t give in to this discomfort. The Sun and the Ring announce a great, warm, and sincere relation, first experienced through the written word. If related to work, you’ll receive a great welcoming. If related to love, you’ll be very pleased to know that others are well-disposed toward you. So, be open, the New York environment will turn out to be very familiar to you, but be cautious also of the stress and pressure that the positive environment can also inflict on you. The surprise card doesn’t really surprise us at all here. In this context, and given that you want to continue with your studies, it looks like you’ll do just that. But your studies will not take center-stage. It looks like the New York situation will play out the love and work relations more. There was really not much left to add in this case here, and the woman was happy with what the cards suggested. Thus, depending on the context of the question, which is always crucial in a reading, one can either go with one type of a reading elicited by a specific spread or a tableau, or simply go with combining cards across time, culture, and type, and thus achieve an equally great sense of clarity. Basically that’s the idea. Most people come to us because they want more clarity on a specific situation. 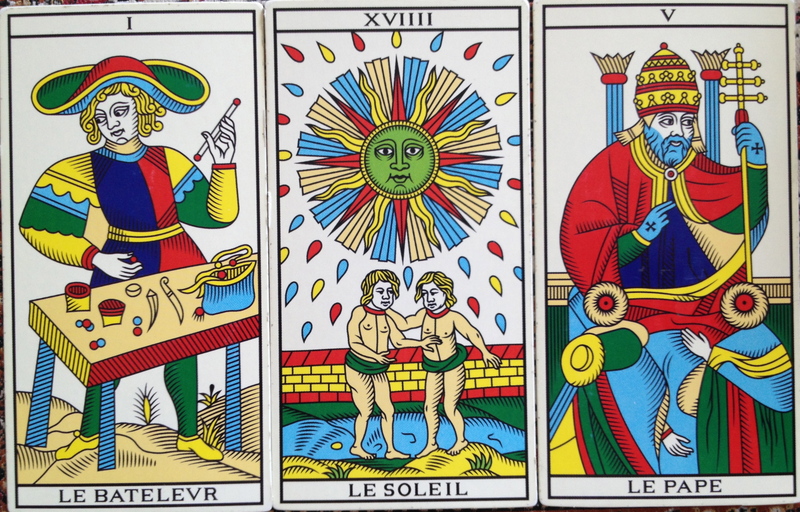 The visual language of the cards is ideal here, as we often discover that the cards articulate either that which we cannot find words for, or reveal a blind spot. I’m tempted to say something about men caught between two women and the situation when one of the women goes to consult a fortuneteller, but I think I’ll save that for another post. Note on the decks, and thanks for permission to use this personal story.